Dentistry for the elderly is important for more than just a tooth cleaning. There is a prevalent oral disease among elderly that often goes undetected by the individual themselves or those providing daily oral care. According to the Centers for Disease Control and Prevention, 70% of those 65 or older have some form of gum disease. These are staggering statistics, especially considering that many elderly have not considered a dental checkup a necessity for years. This disease, not only affects many, but goes undiagnosed and untreated. This alone is reason enough to consider calling a geriatric house call dentist in nyc for your elderly loved one. Gingivitis – Signs include red, swollen gums that bleed easily. This is a mild form of gum disease that can be reversed through good oral hygiene; however it’s presence left untreated can develop into the more serious, periodontitis. Periodontitis (Periodontal Disease) – This form of gum disease can actually cause lasting damage to both the tissue and bones that support the teeth. In periodontal disease, the gums begin pulling away from the teeth and forming pockets, which can become easily infected. Plaque begins to spread below the gum lines and the infection continues to grow. The body’s immune fighters as well as the bacterial toxins present slowly break down the protective enamel on the tooth, only bringing more susceptibility to infection. If untreated, many times the tooth will be lost and gum tissue destroyed. 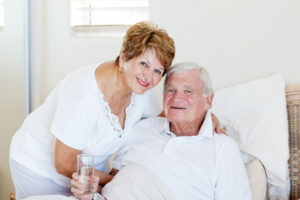 What Can a Geriatric House Call Dentist in NYC Do about Gum Disease? If you or your loved one are experiencing the milder form of gum disease, gingivitis, your geriatric house call dentist in NYC will most likely scrape the teeth free of plaque and tartar build up – a process known as scaling – and check on daily oral practices to ensure that proper techniques are being followed. In most cases, scaling and an increased vigilance to daily oral care can reverse the gingivitis. If periodontitis is present, your dentist will still do the scaling and root planing, but may prescribe a more frequent schedule of dental cleanings and checkups until the disease is reversed. Daily oral care is also highly important in the reversal, but usually that alone is not enough to reverse periodontitis. In severe cases, surgery may be necessary to remove an infected tooth or reattach loose gums. Severe cases may also warrant the use of antibiotics or antiseptic washes. Both will kill targeted bacteria and rid the mouth of the infection. If you suspect that you or a loved one may be suffering from some form of gum disease, contact the best geriatric house call dentist in NYC – Dr. Alisa Kauffman. Her entire dental career has culminated in a passion for assisting the homebound elderly, and she takes joy in each patient she treats to bring a healthier, happier smile, no matter the age.